Wednesday, April 24th 7:45am.. A low pressure system located over eastern PEI this morning will continue to move slowly NE today. A second low pressure system located in southern Quebec is moving east and will redevelop in the Gulf of Maine this afternoon. This new system will then track NE crossing NS during the overnight hours tonight. Cloud and rain will accompany this system. Weak high pressure then builds in for late tomorrow into Friday. We could see some sunshine but not overly excited. A third low pressure system will be approaching from south of the Great Lakes Friday night spreading more rain across the island for Saturday and Sunday. A fourth low pressure system is will be approaching Sunday night with more cloud and showers for Monday and possible flurries on Tuesday. Some sunshine expected on Wednesday with high pressure crossing. The cloudy cool wet spell continues across PEI..
Precipitation.. Rain has ended for now but will redevelop this evening as system #2 approaches. Rain may change over to some wet snow near dawn tomorrow. Shower or flurries then expected for the remainder of the day. Friday is looking cloudy but dry. Showers begin Saturday becoming periods of rain on Sunday as system #3 moves through. Showers/flurries on Monday afternoon through Tuesday with system #4. Temperatures.. Cool today and Tomorrow. Back to normal on Friday, above normal for the weekend. At or below normal beginning on Monday. Wind.. Light WNW now will become NE tonight increasing to brisk northerlies for tomorrow then dropping off to calm on Friday. Brisk SSE develop on Saturday. Hazards.. Wet driving conditions in rain next few days. Anyone driving in NB better check the status of the flooding especially around Fredericton/Gagetown/Jemseg areas. Windy conditions expected on Saturday may result in bridge restrictions. More rain expected next couple days across PEI..
Tuesday, April 23rd 7:30am.. A quasi-stationary frontal boundary currently stretches along the spine of NS between Cape Breton and Yarmouth. Cool air to the NW of this frontal and mild air to the south. A low pressure system developed off Cape Hatteras yesterday and is rippling NE along this frontal boundary. This feature is now located just SE of Cape Cod and is expected to move up the spine of NS overnight tonight and eastern PEI near dawn tomorrow. A second low pressure system approaching from the Great Lakes is then expected to cross Maine and into southern NS by late tomorrow evening. This system is then expected to turn NE and move up the coast of NS during the day on Thursday. This means a few more days of cloudy cool wet weather for PEI. The air will be cool enough to support some snow Wednesday night into Thursday morning especially for areas west of Summerside. A ridge of high pressure will briefly build in for Friday with some sunshine. 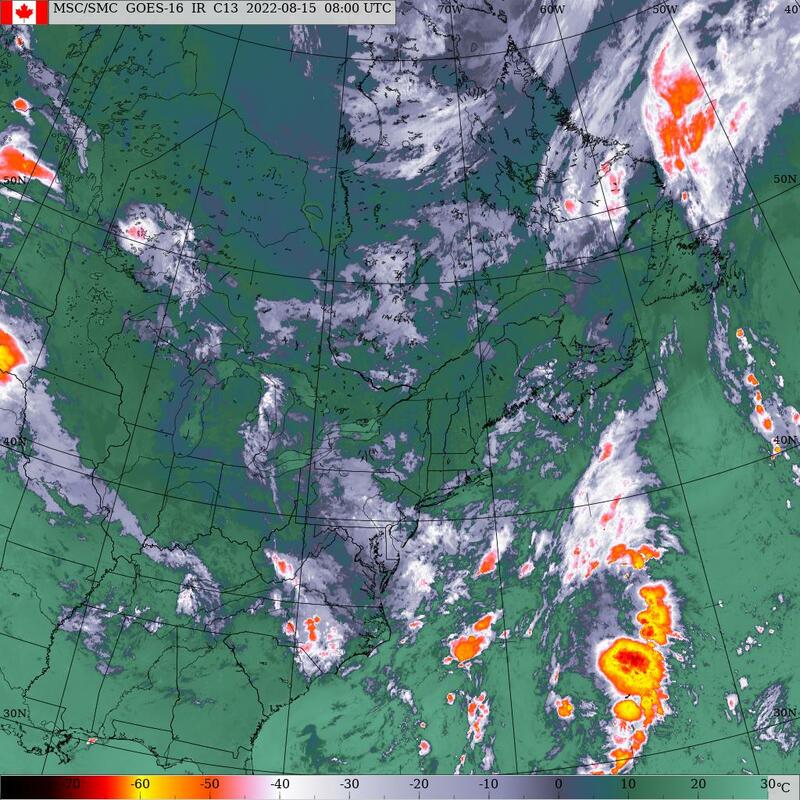 Cloud and rain expected on Saturday as another low pressure crosses the Maritimes. Sunday is looking sunny before yet another low pressure brings more cloud and rain for Monday. Temperatures.. Below normal next few days. Temps should then be at or above normal beginning on Friday but Monday is looking like a one day cool down. Hazards.. Wet driving conditions in rain next few days. Wet weather continues across PEI..
Monday, April 22nd 8:20am... A quasi-stationary frontal system that has plagued the region over the past few days continues to give cloud and showers to the island today. This system dropped just south of the island overnight and is now located in a NE-SW fashion across eastern PEI. Temps will generally cool off now that we are back on the cool side of the front. An area of low pressure developed near Cape Hatteras and will ripple NE along this frontal boundary and is expected to move across NS tomorrow evening. Significant amounts f rain are expected across NS from this system where rainfall and special weather statements have been issued. Any northward shift in the track of this system will bring this heavy rainfall into PEI. A second low pressure system moving across southern Quebec will pass just south of the Maritimes Wednesday night into Thursday morning. Temps will be cold enough for snow up west from this system beginning Wednesday evening then spreading towards Charlottetown during the overnight hours. Skies clear later Thursday as this system pulls away and high pressure builds in. The sunshine wont last long as another low pressure system promises more cloud and rain for next weekend. Precipitation.. Showers/drizzle today becoming periods of rain as the Hatteras system approaches. Rain should taper back to a few showers later tomorrow evening. Rainfall amounts by tomorrow night expected in the 20-40 mms range with the 20 mms up west and the 40mm along the east coast. Murray Harbor though East Point. Showers on Wednesday becoming periods of rain down east and snow up west Wednesday afternoon as the Quebec system approaches. Everything ends near suppertime Thursday. Dry on Friday then a more rain for Saturday and Sunday. Temperatures.. Will be cooler now since we are on the cold side of the front and should remain at or below normal for the next 7-10 days..
Wind.. Light-brisk northerly Flow expected over the next few days. Hazards.. Wet driving conditions in rain next few days. Significant rain down east may result in ditch/field flooding. Watch for possible snow West of Charlottetown beginning Wednesday afternoon. The further west you are the better the chances. Watches/warnings.. None for PEI. Rainfall warnings in effect for portion of eastern NS including Halifax. Anyone traveling through NB needs to check for flooded roads especially in the vicinity of Fredericton/Gagetown/Jemseg. Today.. Overcast with showers/drizzle/fog. Light NE winds, High now at +10 falling this afternoon to 4 by suppertime. Saturday, April 20th 9:30am.. The frontal boundary did in fact drop south across the island near midnight last night with an associated wind shift to the N-NE. This front is now oriented n a NE-SW line just south of PEI vicinity Truro NS. Truro is on the warm side right now at 11 while Pictou NS is on the cool side at 5. This front is expected to lift north again today to be located over the northern Gulf of Saint Lawrence by tomorrow morning but is expected to remain in the area through Wednesday of next week. Several waves of low pressure will ripple NE along this front enhancing rainfall. The last in the series of systems will move through Wednesday night but unfortunately that will also put the region on the cool side with left over showers changing over to some snow on Wednesday night into Thursday morning. High pressure builds in for Thursday and Friday. Precipitation.. Periods of rain or showers expected for the next few days in fact not much sunshine expected until maybe Friday.Could be some wet snow Wednesday night into Thursday morning. Temperatures.. That frontal boundary is separating the milder air to it’s south and cooler air to it’s north. Currently the front is just south of PEI but is expected to lift north again tonight resulting n milder day tomorrow and Monday. At or below temps are then expected for the remainder of the week. Wind… Light NE winds now but will slowly shift back to the SE today as the front slowly lifts north. Winds then shift back to the NE on Tuesday. Today.. Cloudy with periods of rain, light NE winds, shifting to the SE, temps slowly rising through the day to 10 by suppertime. Tonight.. Cloudy with chance of showers, light SE winds, temps climbing to 12 overnight. An extended period of cloudy wet weather expected across PEI. Friday, April 19th 9:40am.. A warm front oriented NE-SW is currently moving northward across the Maritimes this morning and will put the island in the warm sector with temps rising into the mid teens today. The frontal boundary will then shift south again tonight as a cold front putting the island back on the cool side for tomorrow along. In fact this frontal boundary will remain basically stalled or meandering north and south across the region through Wednesday of next week with several areas of low pressure rippling along this boundary enhancing rainfall. So an extended period of cloudy wet but rather mild weather ahead. Looks like the last of the system will push through late Wednesday into Thursday. Some cool air may filter in behind this system by Thursday morning allowing the showers to transition over to flurries as theses cooler temps return. Friday looking sunny at this point. Precipitation.. Rain should taper to showers near noon once the front moves north of the island. I recorded almost 20 mms rain here in the New Haven area during the overnight hours. Basically cloudy with showers expected right through Thursday with several periods of enhanced rainfall as low pressure ripples through. These periods are tomorrow, Monday and Wednesday night. Wind.. Winds will shift back and forth from SW to NE depending on where the frontal boundary is. SW winds now but will shift to NE before dawn tomorrow as the front shifts south. NW winds continue all day tomorrow then shift back to SW late tomorrow night as the front shifts north again.Southerlies for Sunday and Monday then back to northerly on Tuesday. Hazards.. Significant rainfall over the next few days especially up west. Warm-up begins today across PEI..
Thursday, April 18th 7:40am.. An area of high pressure centered just south of NS will continue to drift away from the region today. Clouds ahead of an approaching warm front will spread across the island this later this morning with rain developing this evening. The frontal system will then stall across the Gaspe Region for a few days oriented on a NE-SW fashion. This will put the island on the warm side but the front will be close enough o give cloud and unsettled conditions through the weekend. The front then begins to drop south Monday night moving south of the island for Tuesday. This will then put the island on the cool side with a possible change over to some flurries. Cool Canadian high pressure then crests over the island Wednesday night into Thursday morning clear skies and light winds. Precipitation.. Rain begins mid evening tapering to showers near noon on Friday. Unsettled conditions through Monday evening with chance of showers anytime. Could see a change over to flurries near dawn Tuesday morning which should end later in the day. Temperatures.. At or above normal today through MOnday evening. Normal for Tuesday and Wednesday then above normal again begins Thursday. Wind.. Light SE winds develop later this morning increasing to brisk southerlies tomorrow then SW on Saturday and Sunday. Winds then shift to northerly late Monday night which will mark the cold frontal passage and the return to cooler conditions. Hazards.. Wet driving conditions beginning this evening and continue for a few days. Remaining cool today, warm-up starts tomorrow across PEI..
Precipitation.. Few flurries will end later this morning. Rain begins near midnight tomorrow night tapering to showers by noon Friday which then continue into Saturday and Sunday. Dry for Monday Tuesday and Wednesday. Temperatures.. One more day of cool weather. Warm-up begins tomorrow leading into a warm weekend. At or above normal conditions continue well into next week. Wind.. Brisk north winds today but will begin to diminish later this afternoon dropping off to calm by midnight tonight. Calm to very light west winds tomorrow morning shifting and increasing to light SE through the afternoon further increasing to brisk southerly on Friday which continue into Sunday. Hazards.. Still some flurrie activity this morning giving a coating on the roads. Rain begins late Thursday night.